Bacchus, left, ridden by owner Jennifer Boyce & Abercrombie (aka "Fitch") ridden by owner Molly Knott. 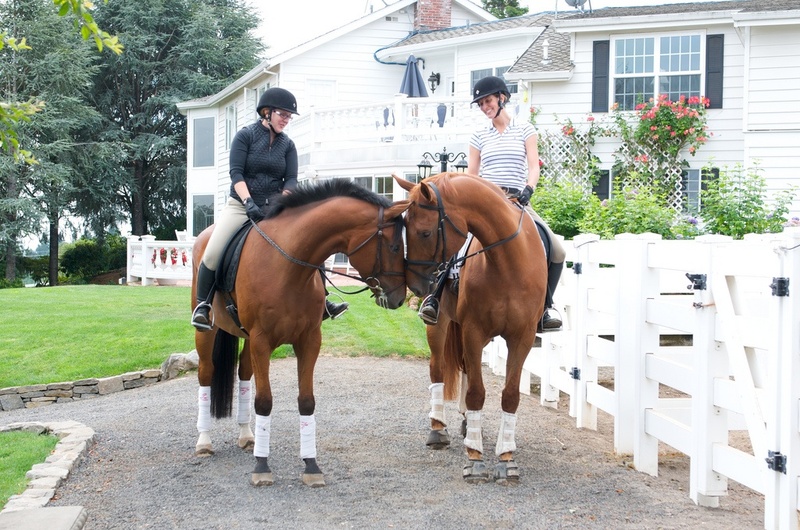 One of the special things about the breeding program at Quailhurst is that the owners who purchase our young horses maintain strong connections to the farm. Many make visits to the farm for lessons, training, and even a bit of R&R from time to time. Last week, four year old Bacchus (Caletino x Tiaraella) spent a week with us on his way home from the Evergreen Classic in Carnation, Washington. On Saturday, Bacchus and owner Jennifer Boyce joined five year old Abercrombie (Caletino x Mon Reve) and owner Molly Knott on a trail ride around the property. During their ride, Jennifer and Molly rode past a pasture where their boys’ mothers, Tiarella and Maile, grazed together on the summer grass. It really is a family affair at Quailhurst! As you can see from the photo, these brothers have always enjoyed each other’s company and were very happy to see each other.